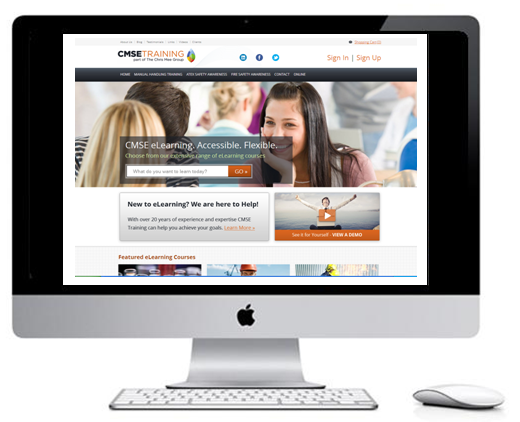 CMSE Training are delighted to announce that we will shortly be launching our Online Training course website. Online Training (E-learning) has many benefits over traditional classroom training. While the most obvious are the flexibility and the cost savings from not having to travel or spend excess time away from work, there are also others that might not be so obvious. Flexible Solution – E-Learning programs can be taken when needed. The courses allow the learner to go through sections of training that can be used and absorbed for a while before moving on, and so are flexible to fit around your daily schedule. On-The-Go – E-Learning can be studied on laptops, tablet PCs and smartphones – it is a very mobile method. Learning can be done on the train, on a plane or any other place where the student has access to a computer and an internet connection. Eliminates The Need To Travel– Numerous studies have shown that E-Learning can cut the travel cost associated with training by at least 50%. Other studies have shown that if implemented properly these costs can be reduced by at least 80%. As users can access the course from any location with a laptop and internet connection, the need to travel to a course, and the cost associated with travelling, is avoided. Lower Cost – E-Learning is a much cheaper option than traditional classroom training, as the overheads and costs of a trainer are taken out of the equation. Therefore, E-Learning is an excellent option for those who require training but are on a tight budget. Training can be achieved at a reduced cost without compromising the quality of the course. Customised / Tailored To You – E-Learning courses can be fully customised to suit the needs of particular customers in specific industries or sectors. What is applicable in training for one person may not necessarily be applicable to everyone else, so CMSE Training can offer bespoke courses to suit the activities of any company. Global Reach – E-Learning courses can be taken anywhere in the world; they are not restricted to any particular location. Ideal for companies with office locations in different countries, as companies can be confident that their staff can receive the same content regardless of their location.